At the southern tip of Thailand’s beautiful tropical island, Koh Phangan, is the intimate and secluded Lighthouse Bungalows and Restaurant. A cluster of uniquely designed bungalows with a beautifully appointed restaurant, built within an amazing boulder setting which overlooks turquoise waters and the island’s magical sunsets. 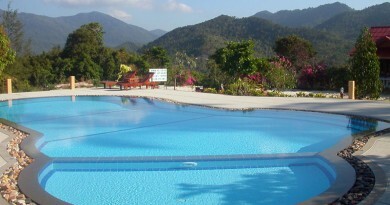 Only a 10 minute walk to Haadrin Village and Beach – Koh Phangan’s host of the famous monthly Full Moon Party – you can relax within this tranquil setting and have access to the unique local Thai culture, lush tropical jungles and some of the most beautiful, secluded beaches in Southern Thailand. Surrounded by nature, the Lighthouse’s location offers spectacular views over the gulf of Thailand where you can relax in your bungalow hammock or sit back in the comfort of the Lighthouse Restaurant and enjoy delicious traditional Thai or European cuisine. The comfort and beauty of the Lighthouse Restaurant offers a range of delicious authentic Thai and European Cuisine in an atmosphere of natural beauty and contemporary luxury. Overlooking the beautiful waters of the Gulf of Thailand, the Lighthouse Restaurant is open for breakfast, lunch and dinner (8.00am – 12.00pm). You can savor a range of inexpensive dishes including traditional Thai soups, curries and noodles; fresh and delicious seafood’s; mouth-watering fruits, salads, sandwiches and a fantastic variety of European meat, fish or vegetarian dishes. Established 17 years ago, Lighthouse bungalows offered peace and tranquility away from the bustle of Haad Rin yet still within easy walking distance through the beautiful adjacent beach know locally as Leela. In the beginning guests were required to make a tricky climb over the hill to access the resort. A wooden bridge now connects us to the beach whilst still retaining the away from it all feel. The restaurant was rebuilt in 2002 to a high standard to enhance your enjoyment of this unique location. The restaurant is surrounded on the three sides by the ocean giving an expansive view of the changing landscape. Deep water access from the rocks offers great fishing and swimming. 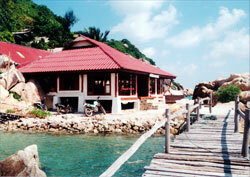 Prices for bungalows all which overlook the sea start from only 200B up to 800B. 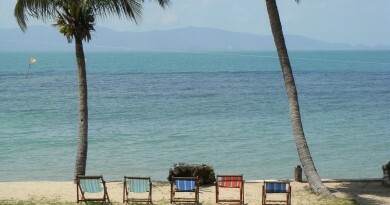 Beware of J.S Hut Bungalows at Than Sadet Beach Koh Phangan – Dangers Lurks!